I have always wanted to write about sewing mostly because it has always been one of my passions. I love looking at patterns and fabric and trying to imagine how this style would work with that print or whatever. But I’ve always faced one major obstacle – I’m actually not a very good seamstress. 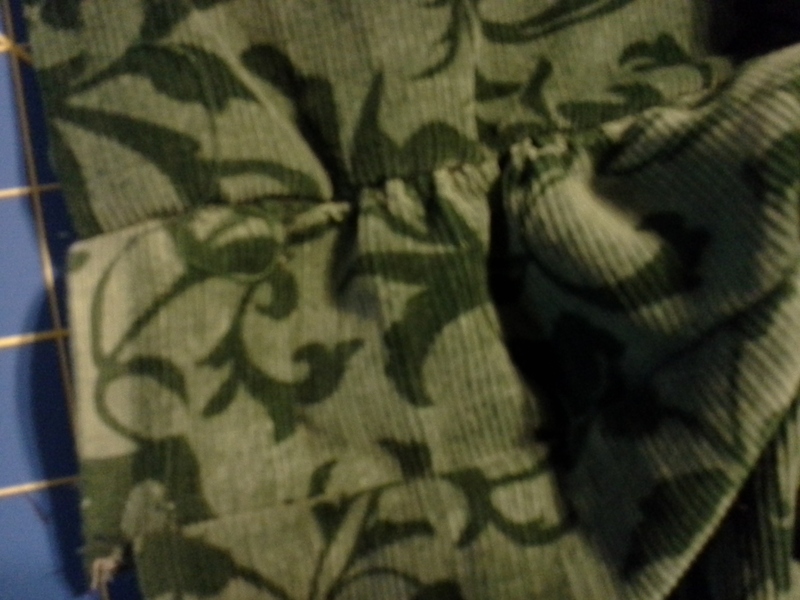 My topstitching is routinely crooked. Corners bulge and facings are in continual rebellion as opposed to laying flat, I don’t care how carefully I understitch and iron. But inasmuch as my lack of skill has never stopped me from tackling projects I probably had no business taking on, there’s no reason it should stop me from blogging about it, either. So consider this blog more of a cautionary tale – a lesson in what not to do. Like me assuming that just because I see a picture, I can recreate the garment. In this case, I saw a jacket in a drawing from Art In Dress (1922) by P. Clement Brown. The version I saw is copyrighted, so I can’t show it here. Also, there’s a nasty racial stereotype in the picture that’s a sad reminder that it wasn’t all that long ago that such images were considered acceptable. We are making progress. Really. The jacket is a loose, flowing one, with a contrast lining and collar. What makes it especially cool is that the contrast also forms a shawl down the front, and the pocket, also of the contrast fabric, folds back over the shawl and is attached to the front. The skirt in the drawing is shown as your basic plaid walking skirt. Except that I really didn’t want another skirt. I have tons of them and don’t wear them that often. But I also had this gorgeous white, black and gold plaid somewhat loosely woven with nubby yarns, and a tighter woven black with gold and white horizontal stripes. And I had a lot of the plaid. 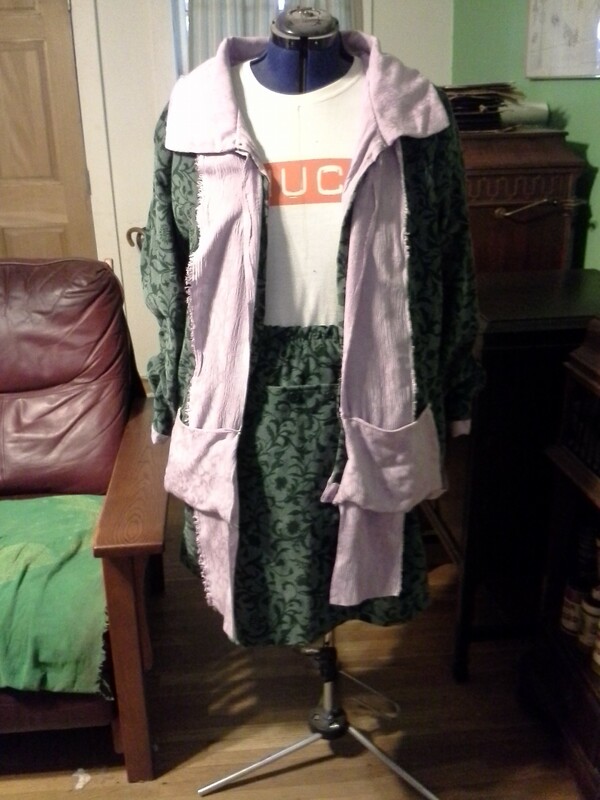 So I decided to make a skirt, too, and use the mainly black piece as the main body of the jacket. Only I’d have to cut it crosswise because horizontal stripes do not make a Margaret Dumont body look good. Now, keep in mind, I write a murder mystery series set in the 1920s. So I get the clothing. I just didn’t start collecting patterns and the like until I grew the aforesaid Margaret Dumont body. So the straight lines of the era aren’t just interesting to me from a historical standpoint. They look good on me. Which is why I found another skirt that I liked better than the one in the book. Again – copyrighted drawing and I don’t want to compound the sin because I didn’t buy the pattern. I just drafted one based on what I saw. The skirt has a front flap that forms an oversized pocket, and while I couldn’t see how the original design was put together, it wasn’t too hard to figure out. Funny thing was, I decided to make a trial version of the above outfit out of some green printed corduroy that I’ve had hanging around for-freaking-ever. Plus I had yards of a lavender mystery blend with embroidered jacquard that was lightweight enough to make a lining. 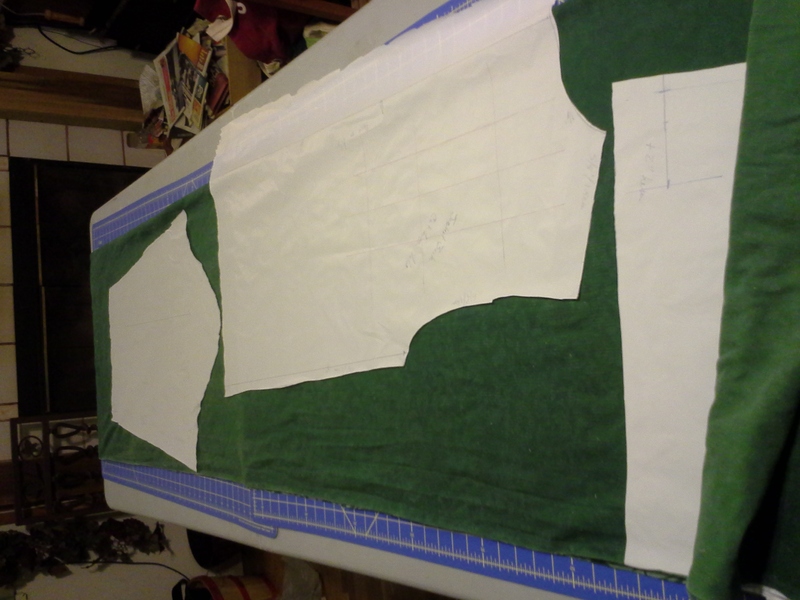 I mean, I’m more or less adapting a basic jacket pattern, I’d better try it out before cutting into the good stuff. Well, it really wasn’t that hard. I made the skirt front in three pieces – the top, cut long enough to form the pocket; the bottom, which had a button tab along the center and was drafted significantly wider than the top to create the gapping side pockets; and a facing for the bottom that was as wide as the bottom, but long enough to form the pocket bag with the top piece. 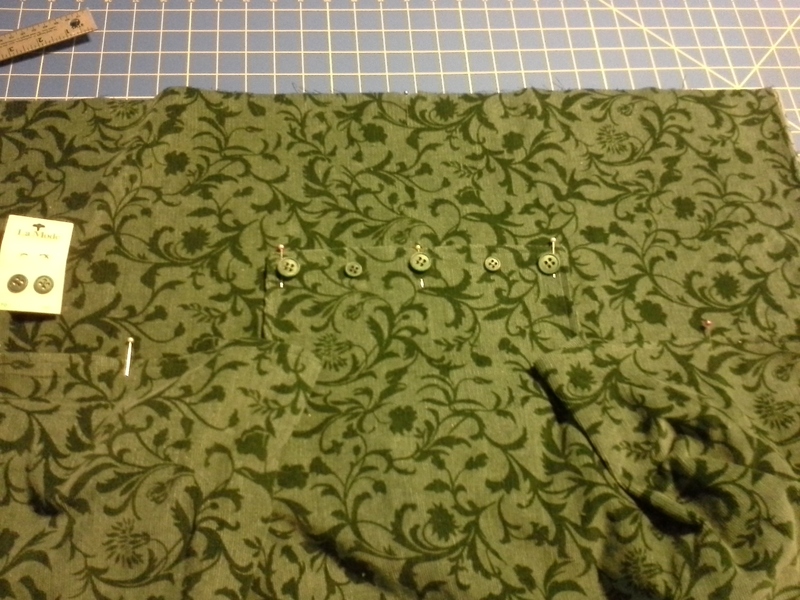 I gathered that piece onto the front and voila – gapping side pockets! The jacket was crazy-making, but still straight forward, except for those wrap around pockets. I finally decided to hand-sew those onto the jacket. Big mistake. They tore off almost immediately. Argh. Now I have to re-sew them back on. The finished product is in the photo below. That’s Bertha, my dressmaker’s dummy. She’s also above in the header image. And I liked the result so much, I did something else with the plaid. My mother can’t sew, either. It’s weird because I don’t see it as all that difficult. My problem is my impatience and lack of willingness to pull stuff apart and get it together right. But I guess it does take a certain ability to see how the pieces come together or something. And I know a lot of people have a tough time with that.